Note to ASA: “Palestine” does not officially exist. A few months ago, after one complaint, the Advertising Standards Authority banned the Israeli Tourist Office from advertising Israel’s most precious site, The Western Wall in Jerusalem, in adverts for Israel. It was another example of how little the Israel-haters really care for the Palestinians because if Jerusalem suffers, the Palestinians suffer. If people flock to Jerusalem they will spend money in the Palestinian businesses there. Despite the facebook group Stop The UK Advertising Standards Authority creating an Israel Boycott with 7,345 members, many of whom complained to the ASA, the ban is in force. It is unbelievable to think that Israel cannot advertise (see advert below) the most religious Jewish site in the world because the ASA has decided that The Western Wall is not a part of Israel. Jerusalem is legally Israel and there is no scenario in which The Western Wall will not be a part of Israel. People should not begrudge the Palestinians from advertising if it would contribute to sustained economic growth and encourage the Palestinian leaders to choose peace over violence and their desire to eradicate the Jewish state. But if the ASA deems the ITO’s advert a misrepresentation then the same applies to the TravelPalestine advert in the National Geographic’s Traveler Magazine (top) (see Jonny Paul in The Jerusalem Post). First, there is no land called “Palestine”. No where has this “land” ever officially been recognised. There is no binding United Nations Resolution that refers to “Palestine”. Second, if Jerusalem isn’t a part of an existing country, Israel, then it certainly can’t be a part of a non-existent “land” called “Palestine”. Third, “Palestine lies between the Mediterranean Coast and the Jordan River” is a complete denial of the Jewish state’s existence. This echoes the racist chant of “From the River to the Sea, Palestine will be Free” sung by anti-Israel activists. Finally, the biggest misrepresentation of all must be that “Palestine” offers “stylish accommodation” and “fabulous restaurants”, seeing that we are continuously told that Israel brutally occupies “Palestine”. It is only right and proper to complain to the ASA that the advert fails to mention such a “brutal occupation” seeing that it is referred to time and again by such eminent organisations as the Palestine Solidarity Campaign, Middle East Monitor and Muslim Public Affairs Committee etc. Surely, these organisations wouldn’t be lying about the true state of affairs, would they? This entry was posted in Israel, UK and tagged Israel Tourist Office, National Geographic, The Western Wall, Traveler Magazine. Bookmark the permalink. why would National Geographic accept such an ad? aren’t they about knowledge and all that? Good point, Silke. Exactly. You would think they would know! They will probably argue that this is just an arms length transaction and doesn’t represent their views, like everyone else does. National Geographic is run by idiots, Silke. A couple of weeks ago I watched an NG programme about the planets on Sky. The axis of the planet Mars is tilted by up to 40 degrees Fahrenheit. I emailed them about this hair-raising howler. Probably don’t understand why this is an error. You’re kidding, Yoni? Probably too embarrassed to reply. I consider it entirely possible that Yoni is telling the truth. Some years ago German NG had a report on the Arab Legion with a beautiful coloured centerfold of them high on camels. Of course I bought it and then I started wondering, so I tracked it backed to the US edition and only there I found a credit to the photographer who happened to be an Australian chap whose archive is online – and there it was a series of black and white photograph i.e. they had doctored the whole thing (photoshopped is too polite a description) and not found it necessary to tell their readers anything about it. How very, very kind of you to consider a well-known liar like me to be ‘possibly’ telling the truth. Isn’t the last point the best point ? It really is lovely over there.They say so themselves.This could be an important document for some time yet. Interesting that Palestinian humor is seen as a selling point for tourists. I see in my mind’s eye all those Western tourists booking holidays in Nablus for a really good giggle. Does anyone know any good Palestinian jokes? I’m too distracted by the Travel Palestine website to think clearly… that must be the first pro-Palestinian website I’ve seen that doesn’t have pictures of piles of rubble and mangled bodies all over the homepage. Amazing. It’s like they’re bored of playing the victim and want to play another game. I’m simultaneously impressed and disgusted… the site talks up all the Palestinian areas, even throwing in some non-malicious references to Judaism and Zionism. And yet they’ve only gone and denied Israel’s existence. So near, and yet so far. I’m more annoyed about the ASA though, and their double standards. Will definitely complain. How about booking a lecture on Zionism when you take your holiday in the never never land of Palestine – take a look at the website in that NG advert. Its a bit odd that the ad says nothing about the fantastic up to the moment international airport in never never Palestine where the never never Air Palestine plane will land for you to start your holiday in the never never Palestininian city of Tel Aviv! My goodness is the world being taken over by a funy farm!! Ah well, bang goes the National Geographic. Never read it anyway. It’s utterly dispensable. 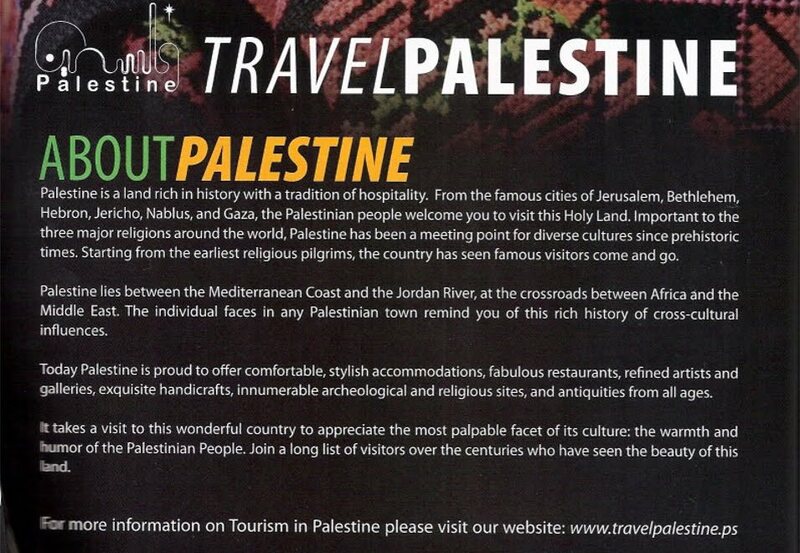 As for the Travel Palestine ad, this bit is rich: ‘the warmth and humor of the Palestinian people’. On my last visit to Hebron, the taxi driver hammered me with the tantalising offer of ‘ a good Arab price, good Palestinian price’….and it turned out to be 10 times the going rate. I like to think there is an ironic self -deprecating humour in there somewhere but I think not. What is on display is the very essence of the ‘palestinian’ psyche…..deceit. Quite so. They never ever try to make out that a woman who died of cancer was murdered by Zionist stormtroopers. Like Silke’s my head is swimming. Does this stupidity merit a formal complaint? I think so, especially when the ASA bans the ITO advert for much, much less. Strictly, that could merely mean ‘between’ i.e. not ‘comprises the entirety between’. And complaining it omits ‘brutal occupation’ is silly. They can choose to omit it if they wish. However, “Palestine has been a meeting point for diverse cultures since pre-historic times” can only refer to the wider geographical concept of ‘Palestine’, as used historically, chiefly in western scholarship or religion, which DOES encompass the territory of modern Israel. Ditto re. ‘Holy Land’ i.e. Terra Sancta, which is the origin of the term. It would be like the Israel tourist board using the term ‘land of Israel/eretz Yisroel, geographically and historically significant to all three Abrahamic faiths, even as Jerusalem, site of the temple, has been sacred to Jews for 3000 years, the site of the crucifixion and resurrection for Christians for 2000 years, and the ascent of Muhammed to heaven for nearly 1500 years’, which would encompass the territory of the Old City and Ha Bayit. Note ‘even as Jerusalem’ does not actually specify Jerusalem is in the territory of land of Israel, ancient or modern. A ridiculous subterfuge, but necessitated by the ridiculous ASA (unfortunately named). If they get away with it, I would suggest that the Israeli tourist board in the UK follow suit, in a similar style. But the ASA are very strict and from the advert a tourist traveling to “Palestine” would expect to have easy access to the sea from there, which they wouldn’t. and come to think of it, Gaza has its attractions. That women aren’t allowed to smoke water pipes is a bit off-putting but then they may have contracted Hamas and a visit to its jails is a highlight of the trip. Back to Palestinian humor, how many Shahidim does it take for one of them to blow himself up? 1) Not all Palestinians are muslims, 2) replace the words palestinian with black and and the shahidim with an equally relevant reference and everyone would decry it as racist- how can you expect individuals to care for your well being if you demonstrate such total ignorance and such callous stereotyping? It is beyond sickening! 3)Palestine does exist, as any student of international law realises, their is a piece of land in the middle east that the UN (when it created Israel) put aside for the predominantely arab population. It is a legal entity with borders and is gaining international recognition The people on the ground call it Palestine, they may not control the functions of the state yet but it does exist legal and ideological form. The arguments posted by the commentators amount to saying that just because a country does not have our recognition as a country it does not exist, yet no one would dispute Israel status as a country in both legal and ideological terms merely because certain arab countries do not recongise its legitmicy. Also strange how a publication such as the NG becomes low intellectual gutter print just because it dares to differ with your particular narrative THe point of the blog was to argue, very badly, that there was a double standard, The reason the Israeli advertising was removed was because it claimed authority over the international territories that were disputed and unavoidably not theirs. East Jerusalam by international including European and even the USA agreement is Palestinian. Had they claimed Tel Aviv as Palestinian you would have had a point. Instead of complaining Israel must get similar ads placed. If then they are banned that will make a good case in law for racial discrimination. A high profile court case brought by Israel with many expert witnesses will be a start in this fight back. Imagine someone advertising your home as theirs. That is pure theft, stolen goods so to speak. It’s time Israel went on the attack against the propaganda instead of always being caught on the back foot. This ad smells if the same stupidity of the Muslim when told there was no blood on the boy’s body in the Al Dura case responded by saying are we surprised that his blood froze from fear before he was shot and neither the interviewer nor the BDS guest even sniggered. We live in a world in which people will accept any rubbish so long as it is aimed at Israel and Jews. We need to expose their stupidity and gullibility. Oh, do tell us the answer Daniel. to see just what place Israel has in the Palestinian Arabs’ mindset. The only international boundaries are one with Egypt and a line through the middle of the Dead Sea. Ariel doesn’t exist. Even Tel Aviv is given an Arabic alternative name. The Key gives symbols for ‘Historic’ Christian & Islamic sites – but (apart from the odd ‘Synagog’) there appear to be no Historic Jewish sites! Much is made on this site of some Palestinian’s refusal to recognise Israel’s right to exist, maybe mutual recognition is the way forward? Well, it has comprised most of the last 100 years, at least. Palestinian Arab Muslims and Christians have Resisted Jews’ existing in the land in other than the tiny numbers to which they were historically accustomed, or thought they were entitled. You mean ‘2 states for 2 peoples’, to which the PA Prime Minister Salam Fayyad wouldn’t sign, since one of those peoples could be construed as the Jewish? I agree. And while you’re at at, why don’t you ask your hero, George Galloway? Of what? Of a non-existent ‘Palestinian nation’? The Arabs could have recognised Israel 63 years ago. The various ‘Palestinian’ gangs in the WB and Gaza are still REFUSING to do so. Great, Mostly. I agree. So let’s hear from you that the Palestinian leadership should immediately announce that Israel has the right to exist as a Jewish state. To be honest, I am not so sure Israel can demand that (well, you can demand anything you like, but that is not the point). Not because Israel isn’t entitled to be a Jewish state, but because such things are not usually demanded between states (though I could be wrong on that e.g. the situation of Pakistan vis a vis India I do not know). To stop denying Jewish historical connections to the land, sure e.g. that article on the Kotel not being part of the temple. The ‘homeland or state of the Jewish people’ would be more reasonable, ‘two states for two peoples’ more reasonable still, since it implicitly recognises two distinct peopls. The P.A. actually considers Israeli Arabs to be Palestinians, nationally speaking, so is not going to recognise an ‘Israeli Arab’ people that is distinct from the Palestinian, since it regards Israeli Arabs as already ‘Palestinian’. The other ‘people’ can only be the Jewish, or at least can be interpreted as such, which most Israelis will, and will act on that basis. Which is probably why Salam Fayyad found it so objectionable. It is not intrinsically wrong to for Israel to define itself as the state or patria of the Jewish people, because Ireland does something similar. And the more the BDS crowd insist on the reverse, the more Israeli Jews will upset them. In fact, by encouraging Palestinian national identity among Israeli Arabs, as they do, the more they make their fuller integration into Israeli Jewish society unlikely. That is what encouraging one nationalism while seeking to suppress another does. They are demanded as a first step in ceasing hostilities. As long as one side has declared genocidal intentions towards the other, the latter is entitled to demand that before discussing anything else. Israel does not need to seek permission from anyone to do so, or to define itself any way it wishes, or to rely on the situation in Ireland as a precedent: it can decide for itself what it does. The Palestinian leadership should immediately announce that Israel has the right to exist as a Jewish state, you heard it from me. Now I would like to hear from you, Richard, that Israel should recognise the right for Palestine to exist along the lines, more or less, of the 1967 ‘borders’ with East Jerusalem as its capital. I agree, but the Jewish quarter and Jewish holy sites of East Jerusalem remain Israeli. Absolutely, so long as Israel has sovereignty over, at least, the kotel, Jewish and Armenian quarter, should that still be what the Armenians want. If the PA would recognise Israel as a Jewish state, I might even give up large parts of Jewish east Jerusalem. Recognising Israel as a Jewish state would go a huge way to convince Israeli Jews that Palestinians recognise their presence as of right and justice, that the end of the conflict is in sight. Therein lies the problem. Mostly can say that they should say “Jewish state” but the Palestinian leadership will never say “Jewish state”. Two words that mean so much but will never be uttered. This is no more for Richard to state, than it is in your power to speak on behalf of the genocidal ‘Palestinian’ gangsters, aka ‘leadership’. The 1967 lines are meaningless, and it’s time that you made a serious effort to get that through your skull. They were ceasefire lines, they became null and void when Jordan decided to start a war, and they have no existence any more. That applies to the status of Jerusalem also. Give them a state. Then after the first rocket attack, declare LEGITIMATE war on that state and act DISPROPORTIONATELY. to give them a state you have to clear out of some important locations, you want to reconquer those piece by piece? Even after you’d have bombed them to smithereens that might turn out to be a very costly operation. If they have a state, then any act of aggression by them against Israel has to be seen as an act of war by the international community, whether they like it or not. No ersatz ‘international law’ could be used against Israel. Then Israel can respond accordingly and with impunity. Silke is right. It could cost the lives of many Israeli soldiers. ‘International law’ is nonsense, a complete fiction or myth. What is important is what Israel’s security demands. “The Palestinian leadership should immediately announce that Israel has the right to exist as a Jewish state, you heard it from me. It sounds so obvious, so fair, so symmetrical – but it is not. On the one hand you have one the Palestinians. After doing everything they could to prevent the State of Israel ever coming into existence and after more than six decades of trying to destroy her, one faction has come to the realization that they just aren’t strong enough drive us into the sea at this moment, so after the fact they begrudgingly acknowledge our existence. On the other side Israel is called upon to take parts of what is historically the Land of Israel and literally create a new state, a state that has never existed before, for those who declare themselves to be her enemies. Gaza – A fundamentalist Islamic Iranian satellite controlled by the Hamas. Palestine – A Jew-free Fatah state that could fall to Hamas control any day, like Gaza did after the last Israeli soldier was gone. Israel- A democratic Jewish state with Jews and Arabs who invariably see themselves as Palestinians, but say here anyway. Such a “solution” is no solution. It would weaken Israel and prepare the way for the next war in which Israel would begin with borders that allow Tel Aviv to be shelled by simple rockets from a thousand Palestinian school roofs. Israel would then not be able to enter the Palestinian State without contravening many principles of state sovereignty nor could we bomb or send rockets back without being told that every rocket had landed on a hospital or orphanage. He is advocating a radical change, that has never been the foreign policy of any Israeli government. When one country shells another, the latter is perfectly entitled to take appropriate measures. Attacking another country suspends any considerations of “state sovereignty”. That is why Israel had entered Lebanon on a number of occasions. It would not be another state shelling Israel. We would be told that it was extreme Palestinian factions who are acting in contravention to the declared policy of the Palestinian state. We would be told that if we retaliate we would be strengthening these extremists and that bombing Palestine would be punishing Abu Mazen for the sins of Islamic extremists. Some idiot would be quick to point out that there was shelling beforehand too. Lebanon is a great example to prove this point and every Israeli incursion there has been roundly condemned by the whole world, sometimes including the US, sometimes not. Even if thee would be some initial understanding of Israel’s need to defend herself this would disappear as soon as it is reported that we are targeting children and innocent civilians. From an internal Israeli point of view it would be hard to mobilize a consensus to reconquer an area that Israel has just evacuated. The Left would find it hard to admit they were wrong, while the Right would ask why they have to kill themselves to repair a mistake that they had never supported in the first place. Finally, even if Israel returned to Judea and Samaria because of Tel Aviv being shelled, what do we do then? Rebuild all the settlements and turn back the clock? That would really be conquering a sovereign state. After things quieten down. if they do, we’d have to leave again and the whole situation would repeat itself. But I take your other points, as I had suggested already in my previous posts. Would you want this state for a neighbour? Would you trust this state as your neighbour? I think that you may be missing the point, Silke. The question is not whether I want such a state as a neighbor or not. I’m not crazy about having Syria as my neighbor either, but I have no intention of declaring war against her to remove Assad from power or anything like that. We’d much rather have Swedes or even Belgians as neighbors. Normally, sovereign states don’t get to choose their neighbors anyway. Had the Arabs living in then Palestine accepted partition, I would not be advocating the eradication of their state, but working to defend myself from it or make peace with it. However, Israel is not being asked to live alongside its Palestinian neighbor, but to literally create it. If we are to take parts of our ancestral homeland and voluntarily give them away to another people, something that has few if any historical precedents, we need a damn good reason for doing so – and their begrudging recognition of my right to exist, because they can’t destroy me anyway, doesn’t cut it for me. What is the connection between ASA and National Geographic? Isn’t one British and one American? Shouldn’t the complaints go to National Geographic? There is a British edition published in the UK, I believe. As such, it is subject to UK law. Why shouldn’t Richard , the acclaimed author of this wonderful blog, give his opinion about the future borders of Israel? But i agree with Yoni and Daniel, my views are irrelevant. I don’t suffer under the threat of kassams. I was responding to Mostly Harmless. My view are based on an ideal world where the Palestinians aren’t led by violently anti-Semitic (Hamas) or cowardly (Abbas) leaders who have no care for peace. Not quite what I said. I didn’t say that your views are irrelevant. I said that you are not in a position to impose your views on Netanyahu et al. Similarly, Mostly does not express the policies of Hamas et al. Incidentally, Abbas is antisemitic be-ribu’a. Your modesty is like a breath of fresh air on a summers day. Though I really would have to disagree that an ideal world would include dismantling settlements and giving away great chunks of my country. I never suggested dismantling settlements. I agreed with Mostly about the 1967 lines being “more or less” the borders, so there could be landswaps. I agree that Israel has a right enshrined in international law to the whole of the West Bank but if sacrificing it can bring a true peace then I feel it is worth it. How do you create a Palestinian state within “more or less” pre-1967 borders without dismantling settlements? Before you say landswaps, look at a map of Israel and explain how you’d have tens of Jewish settlements under Israeli sovereignty surrounded by a hostile Palestinian state. You have a big bottom. Well the idea is for it only to happen if there isn’t a hostile Palestinian state. Slim chance, i know. Nothing about imposing his views on Netanyahu. State as in ‘make an official declaration’. You wouldn’t be just a tad obsessed with me, would you now? Having read the Jerusalem post i have concluded the following. – In that respect i would say that putting politics aside Historic Palestine does indeed have a coastline with the mediteranean……. in much the same way as some people claim Israel or the land of Israel has a coastline with the Jordan river and Dead Sea even though Israel does not have a border with the Dead sea at all nor the jordan river if we are to adhere to international law and politics. ‘Palestine’ was the name given to the country by foreign invaders: Romans, Arabs, Turks, the British. It is not the name of choice used by its indigenous inhabitants, the Jews. They had to use it because they were ruled by foreigners. They no longer are. Accept it and try to move on. In any case, it was never the name of a country, only that of a province ruled by those foreign invaders. There is no such thing as ‘historic palestine’ except as a shameful reminder of many centuries of foreigners ruling the country of the Jews. Quite apart from the fact that “international law” is a myth, kindly look at a 1966 map, and you will see that Israel has always had a border with the Dead Sea even during the Jordanian occupation of J&S, ditto with the Jordan river. Ancient Israel, the land of David, was formed by a bunch of people pitching up and colonising land. England has been colonised continually. back in those days everything was messy, economies were even more fragile than today and development was slow. Even the romans as they marched drastically redraw the cultural and political borders and still have an effect on the way the modern map looks today. Merely because colonialisation has taken place does not negate the need for borders established on concensus lines. Also palestinians have chosen to identify themselves with what has become a geographical term, Palestine. All geographic terms such as continents are words and are historically inherited, but one would not dispute the existence of the border of historically created geographic boundary or term of Africa. There is a difference between historic Palestine and the Palestinian state that will emerge, whose borders will also be influenced by history. And on that point historic israel from way back in david’s time is different in terms of boundaries of the israel today. Does that remove the right to call Israel, Israel because it lacks a historical accuracy. No, the state of the world is such that today we do not depend on ancient definitions as the measure of the validity of the terms that we have inheritited. The influence us but what you are doing is essentially playing a linguistic game that almost anyone, anywhere can play and twist to suit their nationalistic objectives. Israel was called Israel 1500 years before the Arabs arrived from … guess what … Arabia. The Jews are the ONLY nation that has ever had a polity here, a state; so don’t give me that mendacious, twisted argument that the Jews are or were ‘colonisers’. There was no state TO ‘colonise’. ‘Palestinians’ are a fabrication. They speak Arabic, they are part of Arabic culture, and until a few decades ago they shouted at the top of their voices: WE ARE ARABS. So once again, don’t give me that mendacious, twisted argument that because the region was once called ‘Palestine’ by imperialist invaders, the people who arrived from Arabia to squat in it (after conducting a genocidal religious mass-murder campaign against the indigenous people of the entire Middle East and North Africa) are ‘Palestinians’. I don’t mean to upset you but there is no country called Palestine. There was a country called Jordan which while trying to destroy another country called Israel lost a chunk of land. Isn’t it strange that “anti-colonial” Palestinians adopted the name the Roman Empire gave this geographic region, rather than inventing on of their own? Isn’t it strange that all the recognized borders were drawn by the colonial power after WWI? Isn’t it strange that important “Palestinians” such as Sheikh al-Qassam and Arafat came from Syria and Egypt? Has Syria ever given up the idea of a Greater Syria (incl. Cisjordan)? If I remember correctly even PFLP et al. were pressured into sharing this Syrian illusions of grandeur. The whole ‘Palestinian’ thing was invented out of thin air, as a backformation from a name given to the region by a colonial power. Isn’t the way of conquering nations changing places names which already had names strange? Isn’t it strange the way that linguistics and history are connected? what is strange is that you of all people have forgotten about what it means to be a diaspora, i.e. merely because one lives in one coutnry such syria or egypt does not mean that one is defined by that state-definition. Arafat went from palestine to egypt, syria, lebanon etc but wanted to go back home. palestinians living in lebanon is the same- they long for a home that they cannot return to, a home they were expelled from. The logic of your statements needs a little polishing! Isn’t it strange how you ducked answering my main point? Do tell us which other group of whining ‘refugees’ has a UN body dedicated just to them. Tell us which other group of whining ‘refugees’ with a UN body dedicated just to them consists of generation upon generation of descendants. A recent interview with Melanie Phillips on Israeli TV. She harshly criticises…..and rightly so….Israel’s PR Hasbara failure and the shameful historical ignorance of many Israel bashers and ,indeed many Israelis in the Haaretz and Peace Now camp of fools and appeasers. Ahh, Mad ‘the muzzzies are coming’ Mel, you’ve gotta love her. Only ignorant tossers and Jew-haters call her ‘mad’. She has more sense in her little finger than a hundred of you. It’s interesting to note that rather than trying to disprove the thesis that Melanie Phillips was presenting either by negating the specifics of what she had said or by presenting an alternative thesis, you chose to make up a “funny” nickname for her. It is hard to read such comments and to take seriously your claim to be an “an orthodox Jewish studies and philosophy professor..” And if you are, it begs the question whether that is how you generally deal with Jewish philosophical opinions with which you do not agree? It is no less interesting to note that if three decades ago the Israeli Right was often judged to be messianic, irrational and even mystical while the Left was the rational down-to-earth in touch with reality side, things seem to have changed of late. As a Right-wing Israeli settler, I mourn the decline of the Israeli Left, not only numerically but ideologically and intellectually. A democracy cannot be a real democracy without a real opposition, that presents real alternatives, and calling your opponent ” ‘the muzzzies are coming’ Mel,” is none of those. Yep “mostly harmless” i am with you on this. She is a faux intellectual whose statements sound reasonable because she supposedly provides evidence. However, many texts have been written, academic papers and books that continually dispute her findings. Take her population extrapolations in her book Londonstan, an initally convincing demonstration of numbers. Yet her sampling is so disingenious no consencrated academic would ever support her predictions. A good deconstruction of this and the more general fear of “islamisation” can be found in a Catholic historian’s comprehensive anaylsis called “The Future of the Christian Church” It proves that while a small raise in those self identifying as muslims in europe will occur this will be mitigated by the traditional trajectory, whereby 2/3rd generational immigrants tend toward the national average birthrate (making it a sociological not religious argument) and the journey away from the strict observance of faith toward a casual, typically cultural observance, such as te 50% of christian british whose christiainity is indeed only cultural. What makes her a particularly amusing faux intellectual is the absurd use of history. History is narrative that represents far more of those who tell it than actual past events and has internal power drives that drive it toward nationalistic discourses. take her point about jews living in israel 2000 years ago. This is true, but the average european jew and the average israeli bears little genetic or cultural similarity to the jew of today. Using her argument, the americans could return to and settle europe, displacing its resident population because that is where it was from. Take that back 2000 years and if we are looking at a hilarious reality where pretty much the whole world could demonstrate a connection to a land pretty much anywhere. Once again, historical fact is the place of disputation, half real, the other half an insertion of the self. And her comments on political paradigmatic thinking are also nigh on useless. One view is defined by its relation to the other, it depends on the field that it is situated in. It is a choice, yes, but it depends on the direction of the field. So settlers and those that justify violence as a tool of oppression/protection, tend to be on the right of a more liberal europe (which is of course how israel is measured). To call her an intellectual and somehow this academic monolith is false and so much of her assertions (like the one example I gave) simply do not stand up to questioning, research or anything beyond the most cursary of analysis. Anybody know what this drivel is even supposed to mean? Who is ‘the Jew of today’? Anyway, your statement is ignorant crap. The genetic similarity of ALL Jews to Middle Eastern genotypes was demonstrated 15 years ago. For an ignoramus like you to call MP a ‘faux academic’ is hilarious. Incidentally, she doesn’t claim to be an academic, so that’s more mendacious nonsense from you. What is a ‘consencrated academic’? I do not write the blog/s I link to, I merely agree with much of what they say. Try reading them yourself sometime. I have. Which is how I know that they are mostly drivel. yes mostly harmful, we do. Reesh is an imposter and a scoundrel, turning his genius to the evil mission of fermenting anger and strife between the innocent, gullible and near illiterate, Moshe Goldman and other commentators of this excellent blog. sorry if i haven’t been as up-to-date on international law in case it’s changed in the last 5 minutes, but i thought that east jerusalem was recognised by the UN as part of the future palestinian state, based on its existence within the pre-67 borders? isn’t that why no embassies exist in jerusalem and they choose the less-contentious tel aviv instead? The UN is a voluntary club. As such, it cannot pass ‘laws’, international or otherwise. In fact, nobody can pass ‘international law(s)’, since individual countries are the only ones with legitimate sovereignty to do so. There are no ‘pre-1967 borders’, Avraham: that’s another fiction. And guess who propagates this fiction. Clue: it’s not people who love Jews. A ‘future Palestinian state’ may or may not happen, but so far it’s only a propaganda fiction with no concrete existence. thankyou for the reply yoni, but i’m afraid i have to stongly disagree with most of your points. i’m not a massive fan of the UN, but the UN has representatives dictating the foreign policy of all the world’s governments. a future palestinian state is the only thing that gives hope of peace. what alternative would you have? a subservient arab populace? continued conflict and bloodshed? please give evidence that the pre-67 borders are “fiction”. as far as historical evidence goes, they were lands that were conquered from jordan and egypt in the 6 day war which currently have a high arab population, and so areas which it makes sense to have a future palestinian state in. and the point of propagators of the idea of 67 borders being people who don’t love jews is so preposterous that i’m not going to address it. propaganda works both ways, denying the right of a palestinian state is another form of this. and it’s not just the UN, the rest of the international community views jerusalem as contentious enough that no country has placed their embassy in jerusalem but in tel aviv instead. To even refer to the UN as a credible authority in this matter is utterly risible. Recognising it as such is either a sign of arrested development or moral imbecility. Someone who does not agree with you is either stupid or has no morals- so instead as imperfect as the UN is you would rather have a situation of no international concesus that serves as a garuntor of fundmental human rights and at least attempts to negotiate and discuss the legitimacy of certain actions. So you wantcontinual and perpetual war over borders with no state ever sure of where they begin and end, and with citizens who are never sure who represents and protects them? The UN is not perfect , but on this issue there is almost universal concensus, the voting patterns are overwhelming when it comes to settlements and the existence of Palestine. We are looking at 110 vs 6-8 typically on those two issues. But of course that must make everyone who feels that the UN has an important role to play as either stupid or moral disabled. ‘A guarantor of human rights’. Don’t give me this ridiculous crap. The UN is a rotten club of Jew hating tyrannies dominated by the 57 state Islamic bloc….the OIC….with their buddies, bastions of democracy and freedom like Cuba, China and Russia , supporting endless resolutions condemning Israel. The UN should be abolished and replaced with a United Democratic Nations, but that would be a rather small organisation. And someone who disagrees factually with your nonsense is ‘bigoted and racist’, as in your screeching reply to me. See that beam in your eye? The idea that a majority of fascist tyrannies – namely, Islamist hell-holes + China and Cuba etc – against a minority of civilised countries represents a stronger moral position, is so childish and silly that I won’t bother to refute it in detail. Disagree away, Ahmad. The UN still doesn’t pass laws, however much you fulminate: it is a V-O-L-U-N-T-A-R-Y club. Since you started arguing about ‘laws’, you cannot now change your tune, the moment you were shown that this argument won’t run, and talk instead about ‘change’ and ‘hope’ and so on. That’s just waffle. The Arabs’ genocidal intentions towards Israel’s Jews are still there, and Israel is not simply going to forget about them for the sake of some airy-fairy never-never land. Borders are not ‘lands’: you seem to have some difficulty distinguishing between the two (“please give evidence that the pre-67 borders are “fiction”. as far as historical evidence goes, they were lands that were conquered from jordan and egypt “). I am not talking about Egypt: the Sinai was ‘returned’ to Egypt (which has as much claim on it as Japan has), but forget about the Sinai. We are talking about J&S. Nothing was ‘conquered’ from Jordan. Jordan had nil legitimacy for being there: it had been an illegal squatter since 1949. Moreover, those were not ‘borders’ but A-R-M-I-S-T-I-C-E L-I-N-E-S. They became null and void the moment Jordan attacked Israel. I don’t give a tinker’s cuss about what the ‘international community’ – a laughable concept – thinks. Jerusalem doesn’t belong to the ‘international community’ but to Israel. End of. Is it not ironic, the very institution you claim as voluntary regulates much of the terminology you use. Armistice, for instance is a legal term in international law arising out of the agreements between states as to what an acceptable limit would be on behaviour in war in certain circumstanctes. This was subsumed into the UN’s remit and is part of the discourse of international law that the UN (or other elective bodies similar such as the EU and even NATO) is part of regulating. Your naunced but flawed understanding of the difference between armistice lines and border demonstrated precisely the role of international agreements and international interests in the stakes and observance of them. Moroever, the difference between international law and its application nationally is of course problematic, yet take for instance UN interventions such as the Ecowas where legitimicy is given to international action that, whilst might not have a legal funtion in the same manner as a national law, do have force and do contain punishments. Sanctions are an example of an international punishment. Moroever the UN is elective but can choose to act in specific circumstance in an area where the member withdraws from the UN or actively resists interventions, i.e. if it has cause to believe massive huminatirian crisis can readily be avoided. International opinion does matter as does and the agreements do things like make sure refugees are cared for and suitable safeguards are in place, a fundamental argument in th UN for the founding of Israel- pointing out that the jewish diaspora had a need for a space where they could be self-determined. We would like the same for the palestinians as well please! also calling statement like arab genocidal intentions are racist, bigoted and not particularly accurate- It is the equivalent of claiming the israel’s are genocidal, a fact I could garner from the extremist and theocratic extremes of the right plus “historical fact” like the cleansing of villages, so well documented by Avi Shlaim. Before brushing millions of people into one sentence, a moments pause might be helpful, both to ourselves as intelligent beings and to the human duty which we all owe each other. This is so nonsensical, it is difficult to know where to start. I don’t ‘claim’ it, it’s an observable fact. Countries cannot be forced to be UN members. Manifest nonsense. The concept of armistice predates the UN by centuries. Your argument is circular, and begs the question. You cannot rely on the existence of ‘international law’ to prove the existence of ‘international law’. It doesn’t exist, because laws emanate from a sovereign authority and are enforced by a sovereign authority. The UN has no sovereignty, and has no enforcement powers, either legal or physical. The rest of your rant falls to pieces also, because it is based on your flawed premises. PS. As to the screeching nonsense about ‘bigoted and racist’ and the rest of that drivel: it’s the Hamas charter that is bigoted and racist, and it is quite explicit in its genocidal intentions towards Israeli Jews (and we keep being told that Hamas was ‘elected democratically’). Like all Jew-haters, you try to have your cake and eat it. Well, it no longer works. I’m guessing that you’re another one of those critics of Israel, who hides behind initials. I imagine you have good reason. There was a time when our haters were stupid, but at least brave. What ever happened to brave? You are quite right. The Gaza Strip, for example, is only 99% Muslim. Apparently, it’s not much fun being a Christian in “Palestine”. I would blame the evils of “occupation” but that finished 18 years ago. Firstly, I have no idea as to which individuals you are referring. I have written often on this excellent blog and I challenge you to find a single instance in which I expected anyone to “care for my well being”. Modern Political Zionism began when many Jews reached the conclusion that they had had enough of individuals caring for their well being and decided to care for their own. Regarding your substantive point, I would point out that most jokes involving nationality are based on some kind of generalization, which is usually true to a greater or lesser degree. Not all Irish are really stupid, neither are all US cops really Irish. Likewise not all Frenchmen eat garlic and some Italians hate pasta. Not all Jews like chicken soup…I could go on. The truth is that very few “every”s are anything. So what? Fine, in that case what is all the fuss about? If you claim that my house is in the middle of a Palestinian state and some South American countries have even recognized it, let’s just leave things as they are. I never believed that there was much of a Palestinian nation to begin with, mainly just Arabs who wondered into the Land of Israel over the last century or so looking for work, but if they’re happy with the Gaza Strip on the one hand and a virtual Palestinian State in Judea and Samaria (that doesn’t really exist), that’s fine by me. It’s a win-win situation. You may want to try shortening your paragraphs. You won’t be helping the Palestinain cause much if your comments are so hard to read. Rule of thumb. One idea = One Paragraph. have any of them already sent representatives or started to look for places where to house their ambassadors? or is it just the usual hobby of depraved people indulging “it is so much fun to hurt a Jew”? “And if you don’t believe me, I’ll thcream and I’ll thcream until I am thick” (which in your case, being already a thick as 2 short planks, wouldn’t take long). Try reading them yourself sometime. now I get it, mostly is in the pay of pharmacies because they know that whoever reads stuff recommended by her will soon need medication, lots of it and for a long long time. Mostly, witty in his own lunchtime. We have noticed that more than once you have used the expression to be witty during your lunchtime. We gather it is some kind of reference that neither Lionel nor I are familiar with. We thought it might be a Hebrew expression, but Shula (our ulpan teacher) has never heard it either. Could you please explain what being clever during lunch means? It’s a take on ‘being a legend in one’s own lifetime’. You mock a person for being ‘a legend in his own lunchtime’. I simply took it one step further, substituting ‘witty’ for ‘a legend’. 1. “Palestine” has no historical, legal or moral precedents. If it ever comes into existence, it will be as a newly invented “country”. 2. The 1967 “borders” are no such thing. These are the ceasefire lines of 1948, and as such, have no basis as a permanent border. Indeed, UN Resolution 242 makes this clear. 3. The UN is a corrupt and groyesque inversion of what it was established to be. Most members are not democracies, but a collection of dictatorhips, despots and human rights abusers. As such, it holds absolutely no moral authority. As Mark Steyn put it, if you mix ice cream (democracies) with excrement (tyrannies), the end product is going to taste more like the latter than the former. Especially when the proportion is 85% excrement to 15% ice cream. what caused you to be in such a charitable mood?